Adjustable handles for piano regulating tools became popular for the mobile piano technician relatively soon after their introduction around 1900. 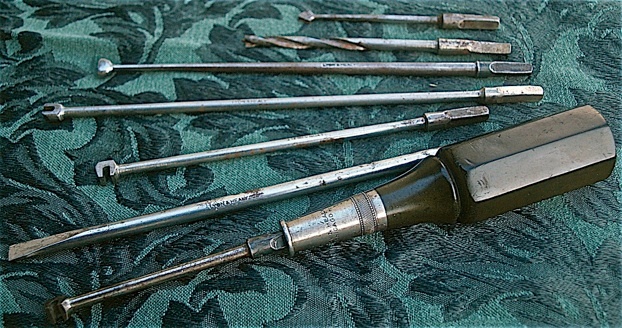 Since a good number of regulating tools were made to be compatible with it, including screwdriver blades with sizes up to 5/16″ for general driving, these handles were used constantly. 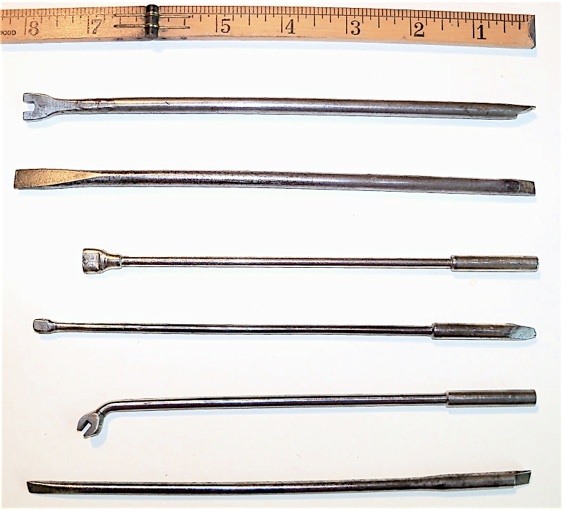 In order to accommodate the different functions of all these tools, Frank Hale at Tuners Supply in Boston offered their combination handles in small, medium, and large sizes. 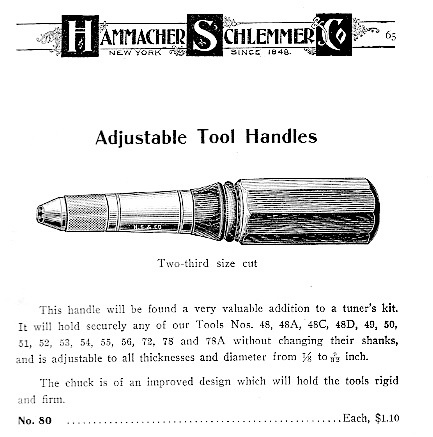 As far as I know, there is no current supplier who offers three sizes, and Hale was not known for having a selection of tools as large as Hammacher Schlemmer or American Felt Co.
By using combination handles, piano tuner technicians were able to save space and lighten their load when carrying their toolkit from job to job. When field work was done in a large metropolitan area, and public transportation was used, every extra ounce of weight made a difference. I can attest to this personally, as I used to take the subway to various jobs during part of my years at at Steinway Hall in Manhattan. By going to combination handles, instead of individual handles for each task, the piano technician gained something but lost something as well. Individual handles would be made specifically appropriate for a given task, but they would be bulky and unwieldy when carried in quantity. When Hale offered three sizes of adjustable handles, he was attempting to compensate for this loss of appropriate specificity. 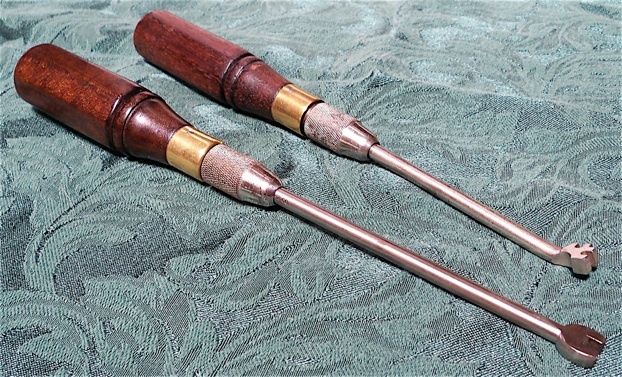 A good example of correctly-sized handles for the tool and the task can be found among selections of good vintage and antique chisels; many modern chisels though, no longer have appropriately sized handles. Because adjustable piano action handles were in use so frequently for a large range of tasks, it was important that the handle be appropriate not only for the hand of the user, but for the tool that was attached, and for the specific task engaged. Small drop screw regulator, which was also for adjusting the grand balancier and the grand jack. This is a delicate and fine tool; the metal shaft is thin and the socket is small in order to pass between grand shanks, regulating buttons, and the most narrowest of places, let-off dowels encountered on many grand actions. In order for the hand to be close to the work performed, the shaft was made short. The handle is commensurately small, with a faceted middle section for situations where a little more resistance was encountered—facets also prevented the tool from rolling off the workbench. A deerskin covering for the index finger, thumb, or palm–depending on the particular task at hand–was applied with bridle tacks to the back of the handle. 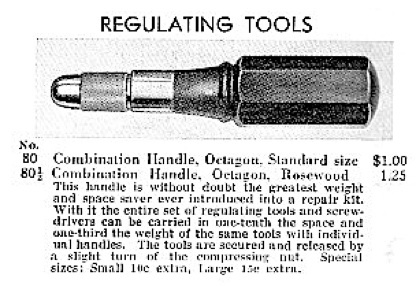 A huge octagonal handle was used on the key spacing tool. 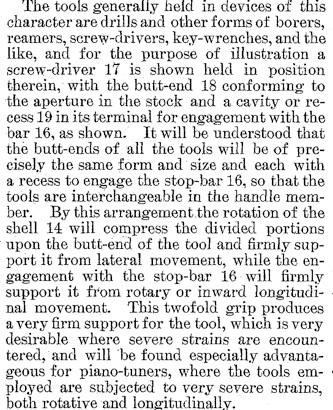 Many key spacing tools from 1880 to 1920 were large and robust like this one, unlike the smaller ones designed for use in the combination handle. These larger versions of key spacers were intended for pianomakers, and the initial spacing during the set up of a keyboard required a more exerted wholesale movement of keys, rather than the touch-up that is generally performed in the field later on. It is also why, I believe, there are many early key spacers which are longer than 15 inches, not including the handle: it allowed the regulator to stand back and look at the entire keyboard at once, without having to stop working. Subtle advantages of correct handle matching manifest with specialization and prolonged work at a single task. C.H. 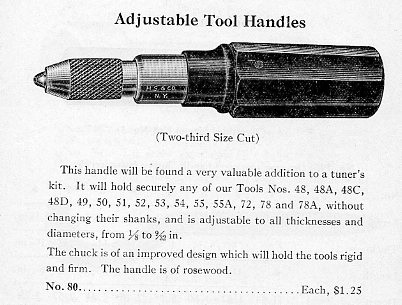 Lang, 1905: “All regulating tools to fit [handle] 20 cents extra, which is nothing compared to all the trouble with the wooden handles.” Lang also referred to the problem of splitting wooden handles, which happened often when the tang was inserted with too much force. Hale combination handle 1935. 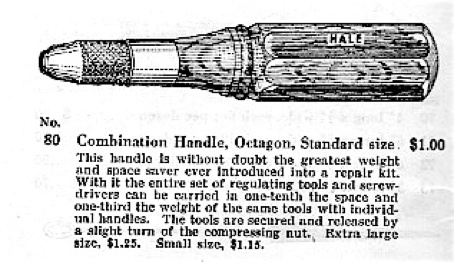 Three sizes were offered, which was a lot considering the rather spartan amount of tools offered in the Hale catalogs. Today, two sizes, at most, are available from any one supplier of combination regulating handles. Hale combination handle 1940. Three sizes, and rosewood was an option for 25 cents extra. Tuners Supply combination handles. 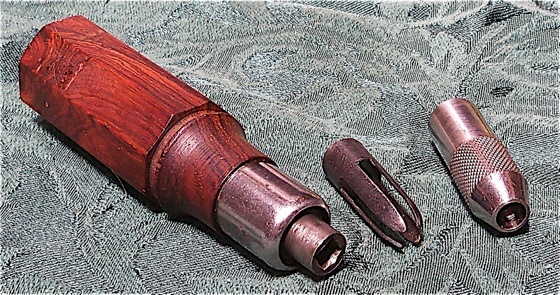 Top, Hale small size, in mahogany, with Hale upright backcheck wire adjuster; Hale standard size, 1930s, with Trefz key spacer. Combination tool handles had been around since the 1860s. Here is an early example, by Millers Falls, patented Jan. 14th, 1868 (Amidon jaw chuck). This same chuck was also used on the Millers Falls #16 brace, which was intended for pianomakers. No. 16 had an unusually narrow 4-3/4″ sweep, consistent with the traditional pianomaker’s wooden braces, and was manufactured from 1884 to 1901. 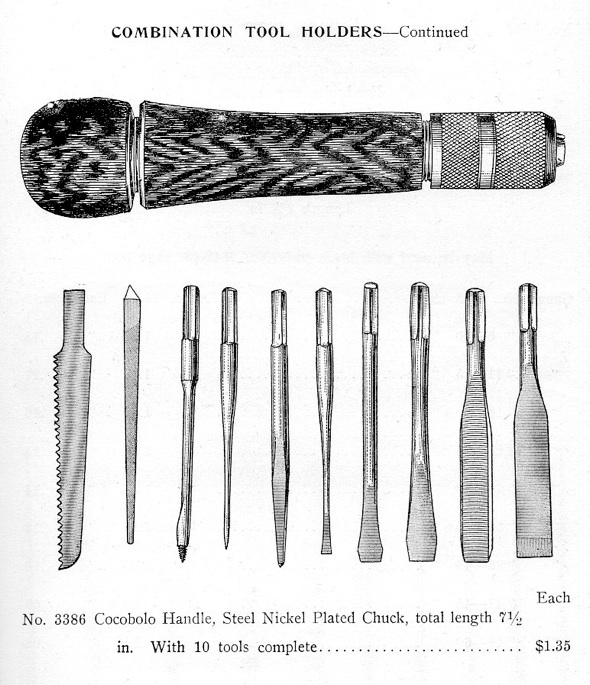 Tool disassembled, showing chuck and tools contained in hollow handle. Miller Falls handle in the 1911 American Felt piano catalog. A difference between the above type of tool handle and the patented handle shown below is that lateral and longitudinal movements of the tool are held in check by two separate functions in the tool, in a way not unlike the present piano regulating combination handle. This differs from the older tool handle above, in which both potential movements of the tool bit are controlled by one piece of hardware, the collet, or in this case, the chuck. The “severe strains” L. S. Davidson is referring to would seem to be more related to tuning tools, rather than regulating tools. American Felt Co. 1911. This is the standard type, with angled cutout at the 1/4″ base of the tool. Its still the standard ‘clutch’ design used today. Richard Reynolds, a piano tool maker in London, made this combination regulating set, c. 1920. The handle looks much the the American Felt combination handle, c. 1911. No. 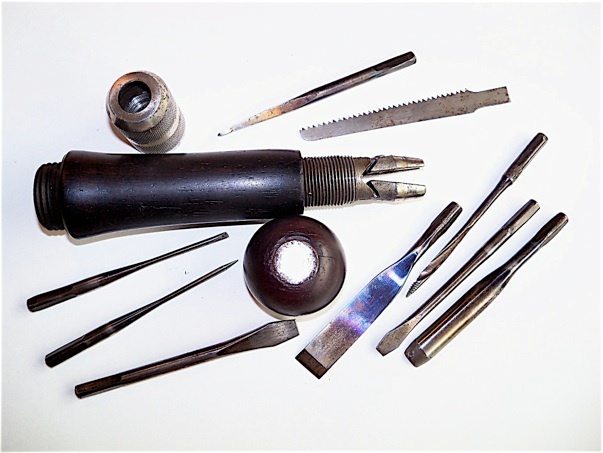 686 is a wire bending tool with a screwdriver attachment, which is a regulating tool unique to England. Two choices of regulating sets were available in Goddard’s no. 80, circa 1938 catalogue. Reynolds products were consistently the more expensive choice across the board. 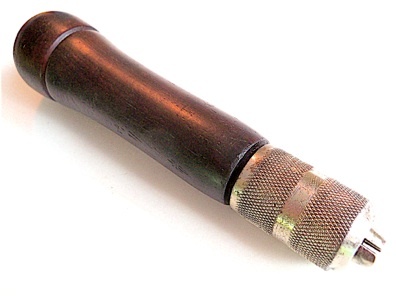 In the 1940s, J.& J. Goddard in London moved to a thumb set screw instead of a collet. G. F. Baker offered a similar design in their c. 1950 catalogue, and Fletcher & Newman offered same in their 1976 catalogue. Another collet and compression nut type, found with a pre-WWI toolkit comprising of Erlandsen, H.S., and A. F. tools. These also accept the modern or standard arrangement. I’m not sure who sold these, perhaps American Felt Co. by process of elimination. H.S. offered combination handles that accommodated the traditional tang. 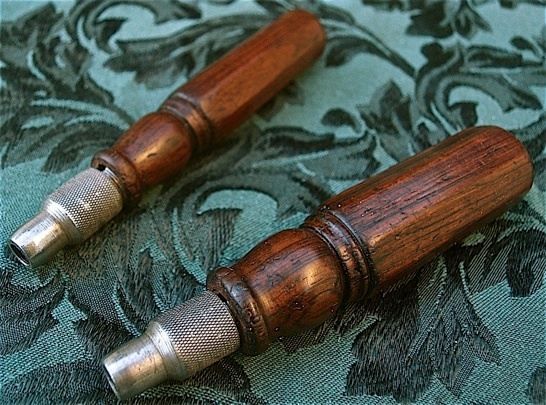 Unmarked, with a London pattern handle, and hardware similar to the American Felt Co. example above. Early combination handle with friction fit hardware that is heavy and well machined. Tool with 1/4″ base and angled cutout attached. Lyon & Healy combination set, handle made of ebonite, fairly similar to C. H. Lang’s before it. The proprietary L&H tools have a square base which were designed to work with this particular handle only. To release, you depress a tab on the back of the handle by tapping down on a hard surface. It works well (as long as one doesn’t do this on the piano cabinet!). Circa WWI era. L. & H., circa 1916. Trefz combination handle, aluminum, probably early postwar. 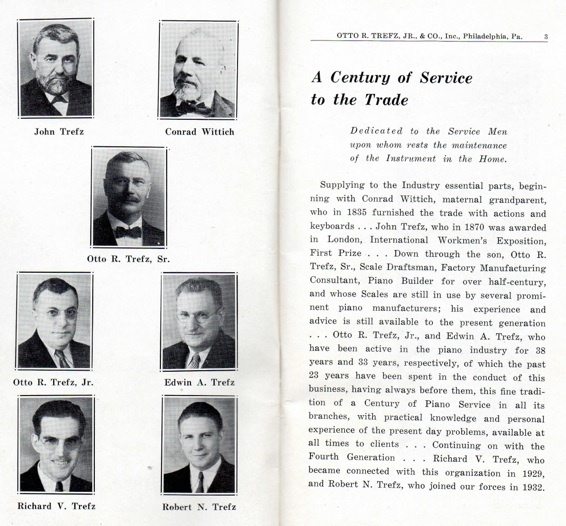 From Trefz 1935 catalog. 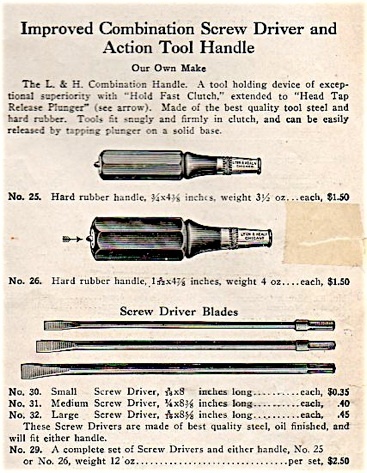 Trefz carried the full Hale tool line in 1935, but I’ve seen a range of proprietary regulating tools, made post-WWII. Rebuilding supplies, however, were a focus of this company, and pinblock, bridge, and hammer duplication was prominently featured. A large range of grand hammershanks and flanges was carried as well. These interchangeable tools will fit all of the handles shown above, and were made within that time period as well. 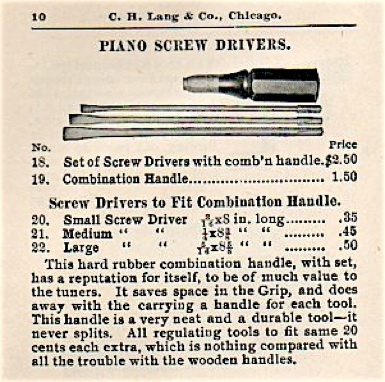 H. S. and Co. made their adjustable handles to be compatible with the traditional tangs found on piano regulating tools. c. 1918. This is a handmade combination handle made from a modified drill chuck which was originally intended for use in a hand brace. The set screw fits inside a key spacing tool, and the socket accepts C. H. Lang regulation tools. I found this tool in Jonesport, Maine, in August, 1979, as part of a tuners set. A drill chuck similar to the modified drill chuck fit in the above handle. Same handle with Lang wire bender attached.